The fall season has landed upon us and it is the perfect chance to think of new ways of incorporating world flavors into your menu, at least, according to our industry expert Brian Murphy. “The increased desire for world flavors provide an excellent opportunity to experiment with different spices,” Murphy explains in his latest post. Truth is this desire is highly driven by millennials who are eager to explore the world through their food. According to the National Restaurant Association’s Top 10 Hot Trends report, “Consumers' sophisticated palates, driven by international travel and access to a wider variety of ethnic cuisines right here at home, inspire chefs to immerse themselves in food from around the world” fueling the ethnic food trend. This does not mean you have to stick to traditional ethnic dishes. It’s OK to experiment. Guests seem to be more open-minded and are ready to try different depths of flavors and your take on worldly dishes. So, spice up your food offerings! This is the perfect opportunity to offer your guests a dish that is not only exciting for them but for you to create. 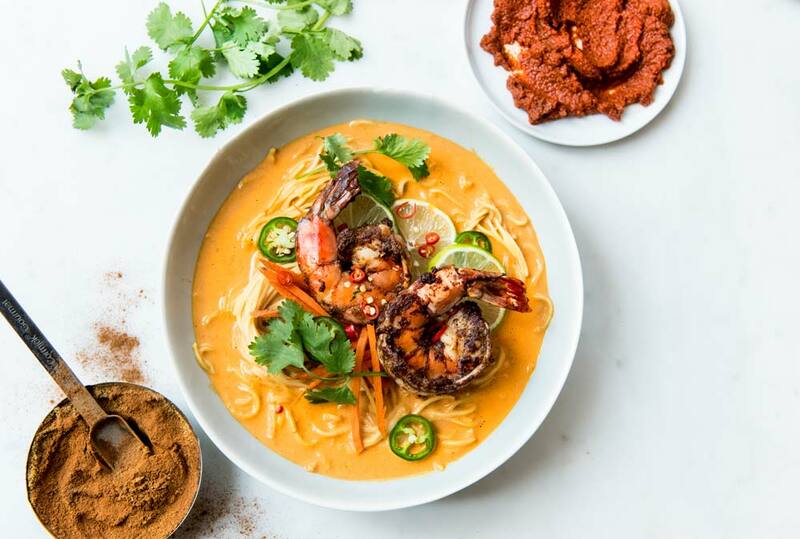 Try this Red Curry Noodle Bowl with Spice Rubbed Shrimp dish that is sure to leave your guests satisfied and delighted. Chef Louis Robinson, owner of Spice Florida, shared the recipe with us and below you have all the information you need to create it yourself and make it your own. Don’t be afraid to experiment with different proteins, styles of cooking, and kinds of spices. Club House and Thai Kitchen, for example, offer an array of condiments and products that can help take your dishes to the next level. Start by preparing red curry sauce. Combine your curry paste, coconut paste, coconut milk, fish sauce and lime juice in a saucepan. Stir well to combine. Bring to a boil, and reduce to simmer. Allow to simmer while you prep the rest of your ingredients. Season shrimp with the salt, cayenne pepper, cinnamon and ginger. Get a large nonstick super-hot on your stove. Add the oil, and then the shrimp. Flip only once, after about 1-2 minutes. Cook one more minute on the other side and then remove. Divide your noodles into 4 bowls. Pour red curry sauce over the noodle. Top with shrimp and garnish with carrots, jalapeño, lime and cilantro.